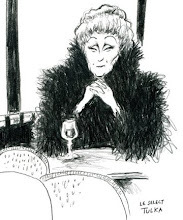 I knew when I saw this tart on Thilbeault's Table blog that I was in trouble...big trouble! I didn't want to wait for an occasion to try it, but couldn't justify making such a decadent tart just because I wanted it now! So I made small tarts in 4 inch tart pans that I bought at E. Dehillerin's in Paris. I did need to break them in...didn't I?? So now I am only in a little trouble ;-) And, I can give the others away. 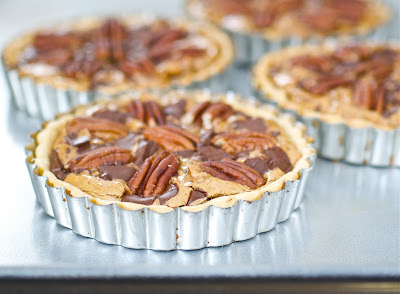 So for this Saturday's Blog Showcase I am making Double Chocolate Pecan Tarts. This recipe has traveled like a chocolate chain letter, with each person adding their own signature. I made Ann's dough using all butter in the food processor. Ann at Thibeault's Table substituted the corn syrup with maple syrup in the tart. I substituted it with organic raw Blue Agave Nectar.....now it's healthy, right?! Don't break the chain...add your signature and pass it on! I'm showcasing three blogs this week, Thibeault's Table, Rollin in the Dough, and Annie's Eats. Thanks Ann at Thibeault's Table, and Lori at All That Splatters for hosting this showcase. Add the flour, sugar and butter to the bowl of a food processor and pulse. The mixture should be the size of peas. Pour the ice water into the feed tube of the processor, so that it drips down while the machine is running. Process until the mixture forms into a ball and stop. Any overworking will make the dough tough. For the tarts, cut into 8 pieces, wrap in plastic and refrigerate for an hour. On a lightly-floured work surface, roll each of the 8 balls of the pie dough out into a round. Transfer the rounds to 4-inch tart pans. Trim the edges as necessary. Freeze the dough-lined tart pans until firm and very cold, about 30 minutes. Adjust an oven rack to lower middle position and heat the oven to 375° F. Remove the dough-lined pans from the freezer, press a sheet of foil inside the pie shell and fill with ceramic baking beads. Bake about 30 minutes, until the dough looks dry and light in color. Carefully remove the foil and weights. Continue baking the crust 5-6 minutes more, until light golden brown. While the pie crust is baking, make the filling. Melt the butter in a medium heatproof bowl set over a pot of simmering water. Remove the bowl from the double boiler but maintain the simmering water. Stir in the sugar and salt with a wooden spoon until the butter is absorbed. Beat in the eggs, corn syrup (or substitution) and vanilla. Return the bowl to the double boiler and heat, stirring frequently, until the mixture is shiny and hot to the touch, about 130° F on an instant-read thermometer. Remove from the heat and stir in the pecans. As soon as the pie shell comes out of the oven, lower the oven temperature to 275° F. Pour the filling into the pie shell. Scatter the chopped chocolate pieces over the filling and press into the filling with the back of a spoon. 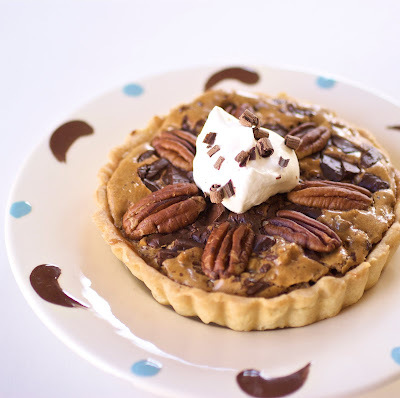 Arrange pecan halves in a circular pattern around the tarts. Bake on the middle rack of the oven about 50-60 minutes, until the pie looks set but slightly soft, like gelatin, when gently pressed with the back of a spoon. Transfer to a wire cooling rack and allow to cool for at least 4 hours. Makes 8-4 inch tarts or 1 large tart. The recipe may also be cut in half. Double Chocolate pecan Tarts recipe click here. Oh Diane, I love the idea of making individual tarts. Makes for a much prettier presentation. 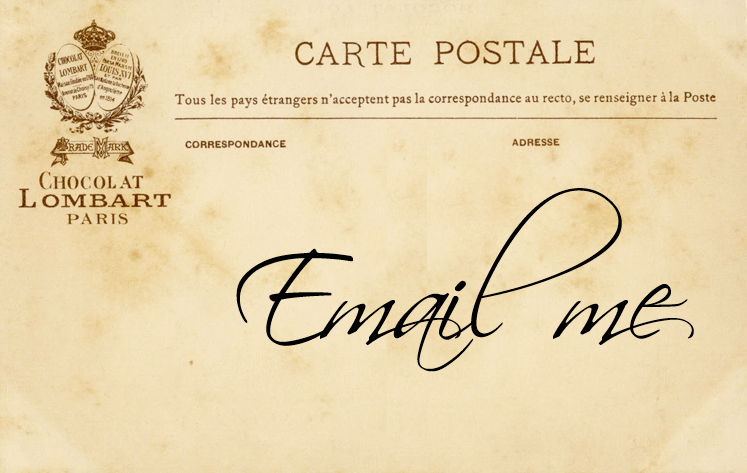 Thanks for participating in the Saturday Blog Showcase. Diane, that last shot is killin' me! 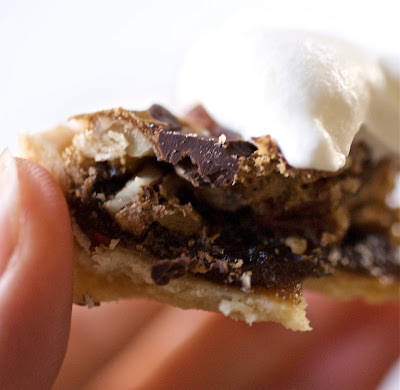 My jaw dropped when Ann featured this beauty ~ your idea of making them in generous individual sized tarts is brilliant. is that a dollop of whipped cream with chocolate shavings gracing the top of these beauties? btw: love the link for printing out recipe! I really like the individual size! I keep seeing these tarts, soon I must make them. I remember when you bought your tart tins:) Look what you did..They are lucky loved little tart tins..Oh lala..Bravo. Your photography left me salivating... I LOVE that you made little tarts. I was trying to think how I could make this tart for just me - now I know!! My mouth is watering, just LOOKING at these. I am going to have to try to make them! i dont blame u for wanting to make these...they are mouthwatering! beautiful! Just beautiful. 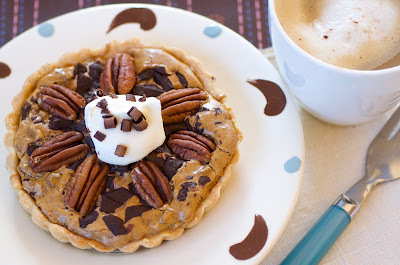 "Saturday Showcase Blog" is such an amazing idea, otherwise I might never have come across your post lol, Your individual DC Pecan Tarts are so delicious looking, that last photo has me drooling too. Kathy. Oh my, this looks decadent! These are so cute and impressive!!! Such a lovely Valentines tart for sure! I love that you made these into individual tarts. They sound delicious and your photography is amazing! These are gorgeous. I love how you've made individual tarts. Very clever. Holy cow no wonder you made them Diane!! Your's are beautiful. And I didn't realize you were an artist. That makes a lot of sense now. Ummmm....lemesee, chocolate, pecans, pastry, maple syrup--I'm in! this is so cute and i love your dishes! Pecan pie, I had the opportunity to try the last two years ago when I was in America, I believe that this is a very tasty dessert.